Since being given the chance to review the first half of the Haikyu!! Season 1 anime, I’ve been eagerly awaiting the release of the original manga by Viz Media. As I mentioned back when I reviewed the anime, I am not much of a sports person but there is something special about this series that keeps me captivated. I wanted to find out if the manga would have the same hold on me and I’m happy to say that it does. Haikyu!! is a Shonen Jump series that follows the story of Shoyo Hinata, who, inspired by a legendary player know as ‘the Little Giant’, wishes to become the best volleyball player ever. His major problem is the fact that he’s fairly short, but with determination and some amazing jumping abilities he’s hoping to overcome the wall before him. For most of his time in junior high, Hinata is the only member of the school’s male volleyball club, but after convincing some of his friends to join him, Hinata gets to take part in a tournament for his final year. In the first match Hinata’s team is put against the favourites to win and there he meets Tobio Kageyama, a king of the court with amazing reflex abilities but an inability to work well with his teammates. After Hinata’s team is beaten solidly by Kageyama’s, our young protagonist vows to someday surpass Kageyama and defeat him in their next game. Hinata then starts the first year at Karasuno High, the school where his idol, the Little Giant, played volleyball. However, when Hinata goes to join the club he runs into Kageyama, who is also attending the school, and discovers that the two must now work together on the same team! Will the former rivals be able to put aside their differences and work together for the good of the Karasuno team? The answer to this question, at least for as far as we get in Volume 1, is definitely not. Hinata and Kageyama are told by their three senior club members (Daichi Sawamura, Koshi Sugaware and Ryunosuke Tanaka), that they must prove that they can work as a team before they’re allowed to set foot on the court. Not only do they have to show real teamwork, they’ll also be playing in a match against two other newcomers to the club. If they lose, Kageyama will never be allowed to play his favourite role as a setter in the sport. 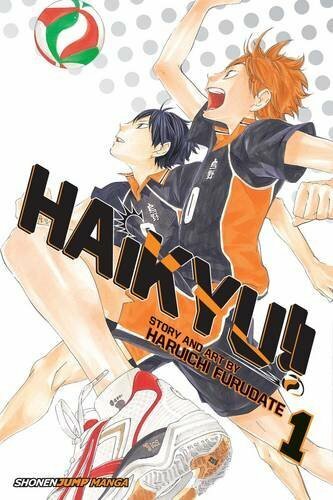 This first volume is home to seven chapters and doesn’t reach the conclusion of the decisive match of the Karasuno first years. It does, however, firmly set in place the relationship between Hinata and Kageyama. The two are rivals in every sense of the word but they also have a lot in common. Even within just seven chapters they begin to change one another for the better. It’s actually quite impressive to see how much the characters grow in such a short space of time, and Haruichi Furudate proves a very good mangaka in the way their development is handled. Of course you can’t have a Shonen Jump title without a healthy dose of action scenes, which Furudate also delivers on. Haikyu!! is packed full of incredibly well drawn action scenes, such as when Hinata is playing his match in junior high and even when he’s simply just practising with Kageyama. The characters feel truly alive, just as if – although you’re looking at static drawings – you’re actually watching them run around the court. Every scene has been well thought out in the effort to keep the reader truly immersed in this world – and it works beautifully. Production I.G have been working on the anime adaption and I originally thought that some of the stylistic choices were down to them, but that simply isn’t quite true. The studio are doing a wonderful job with the anime but Haikyu!! is just as special in its original form as a manga. The comedy, action and overall brilliance is all at the roots. That said, I definitely miss the wonderful anime soundtrack and while reading this volume of the manga I had the first opening and ending themes looping in my head! The anime also delivers slightly better with the comedy, but the manga’s efforts are by no means bad. More than anything I just need to spend more time with it. My only other thought regarding the first volume of the manga vs the anime is that the anime gives us more time with Daichi, Koshi and Ryunosuke early on so you get to know them faster. In the first volume of Haikyu!! we’re introduced to them but they’re quite heavily pushed aside in favour of development for Hinata and Kageyama. I’m sure the second volume will solve this issue but for now I’m a little disappointed as I really like those characters and wanted to see more of them this volume. It’s worth noting that you don’t have to know anything about volleyball to enjoy Haikyu!!. The sport is fairly easy to pick up but the series is also good at explaining the more complex elements as they come around. It’s never enough of an information dump to be intimidating and more little bits of info here and there to slowly build your knowledge (and not be bothersome if you already know plenty about the sport!). Too many series fall into the pitfall of overloading the reader with expositions but I’m really pleased that Haikyu!! strikes the balance nicely – something I also praised the anime for. Having watched the anime and now reading the manga, I can see why Haikyu!! is so popular in Japan and why it has such passionate fans. The characters have boundless energy and thus so does the person experiencing the story, whether it be thanks to the manga or the anime. I think the anime is probably the better entry point to the series but the manga is still a solid read. With Viz Media aiming to release a volume of the manga every month (at least until January 2017 judging by the release dates we currently have), I’m looking forward to spending a lot more time with Haikyu!!. I cannot recommend this series highly enough for shonen fans as it’s just great fun with some wonderful artwork and a strong cast of characters. Like Naruto, One Piece, Bleach and other Shonen Jump titles, Haikyu!! truly belongs in everyone’s manga collection.